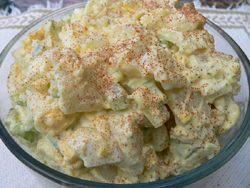 American Potato Salad is a comfort food for me. Mom would always be the one to bring it to all family gatherings. This was her specialty dish and I am happy to pass it on to you. Mix all in medium size bowl and cover. Refrigerate for at least one hour before serving. Before serving, Sprinkle with paprika and garnish with parsley.